To distract from my lack of exciting Ravelympic progress, here are some more finished objects. Not really so recent anymore . . .
Once again in my beloved (and discontinued, /cry) Regia Silk. And once again too small for me. I haven't gifted these to anyone--the last, similar pair went to my mother for her birthday. I'll keep 'em on my shelf until I find the right recipient. The astute observer will note that dude has ENORMOUS feet. Just trying to get one to a size that would fit took me six weeks! 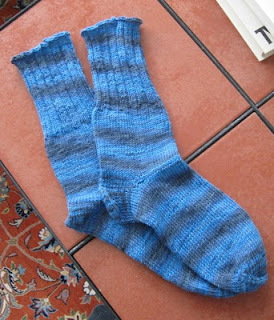 The second, however, was a much quicker knit once I knew the proportions I was looking for. It's really quite incredible, though; I'll have to get a comparison shot at some point. I have big feet myself, but this is ridiculous. On the other hand, I don't have much leftover yarn hanging around. So there's that. Well, I got off to a blazing start by . . . forgetting the needles I needed to cast on and therefore not casting on until Saturday. 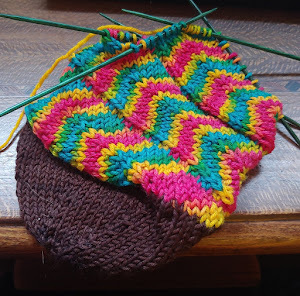 But Irtfa'a is safely on the needles now. The provisional cast-on gave me a bit of trouble, as I'd never done one before, but I think i figured it out . . . Anyway, I finished the opening edging section, and I'm now working on the shoulder shaping. I only have 15 rows of that knit, but it's been getting faster all the time. My hope is that I can really fly once the increases are finished! 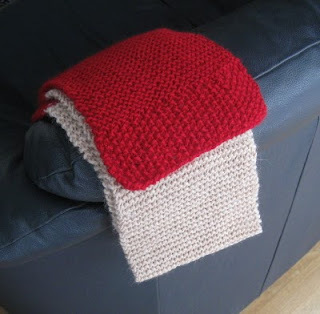 This is a plain scarf for the Red Scarf Project, which, basically, gives care packages to young people with no families. These kids (I say kids, but they're not much younger than I am) are making their way with virtually no support networks. My family has been very supportive of me, especially in the past year, financially, emotionally, spiritually, and in generally making my life easier, and I can't imagine living without them. So this is definitely a very, very worthy project, and I encourage any of you reading to check it out. I'm part of a 2010 KAL for the Red Scarf Project running through the #1 Knitspot Fan group on Ravelry, so I hope to knit 12 scarves to donate this year. As well as being lots of fun, it's a good way to give back with my knitting. I'm participating in the Lace Luge and the Short Track Shawls events with an Irtfa'a, and I am SO EXCITED! I am such a nerd. But I have fun doing it!